One thing I really, really liked about Compiz was the ability to hold down CTRL, drag the mouse over part of the screen, and take a screenshot. Sadly I discovered this about a week before it broke in 11.04 – every screenshot had a blue tint. After the move to Awesome WM, it seemed like scrot was the way to go, so I had a couple of binds to take a full screen shot with PrintScreen and a shot of the current window with the modkey and PrintScreen. It worked okay. Then I found xsnap – a small utility that very nearly does the same as Compiz, when combined with a suitable key bind. So now I hit PrintSreen, and drag the mouse over the area I want, and it’s saved with a simple datestamp in PNG format by default. 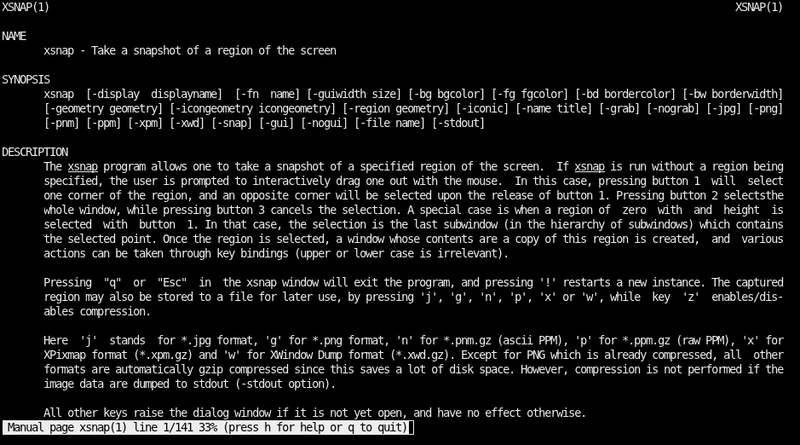 And there are other command line options to play with, though it works fine for me as it is. I can’t understand why this one doesn’t seem to be more well known, as for me, it deserves to be. How did you use scrot to make a screenshot of the current window only, rather than the whole screen? I didn’t – I use xsnap. So that should do it for you. A debian user told me that they have scrot -u but I wasn’t able to find that parameter in arch’s scrot.